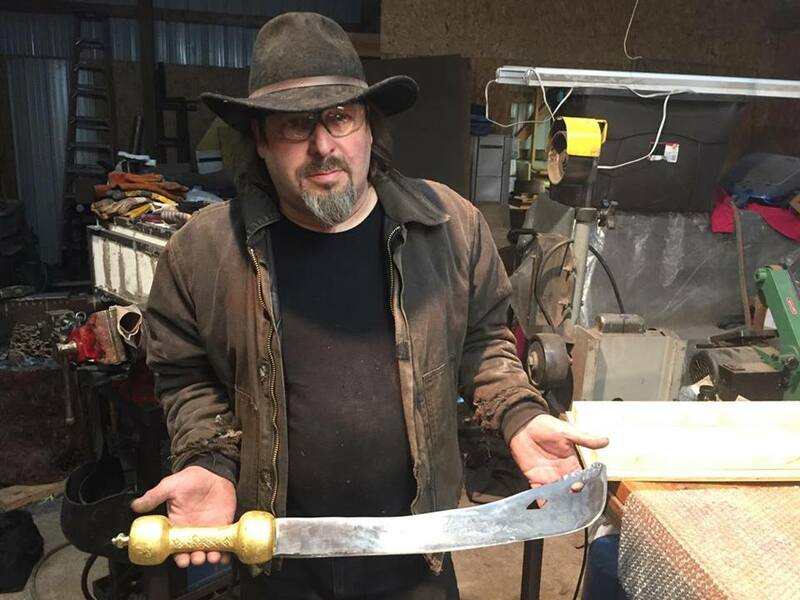 Master Thorpe displays the African blade he made in his home forge for the third round of the show Forged In Fire. Photo by THL Fionnghuala. Æthelmearc fans of the History Channel’s metalsmithing competition, Forged In Fire, recognized a familiar face last week: Master John Michael Thorpe. One of four competitors in the sixth episode of the fourth season of the show, Master Thorpe was named the champion of that episode’s challenge and won the $10,000 prize. A metalworking Laurel and an SCA member since 1982, Master Thorpe has lived in Myrkfaelinn, Nithgaard, Thescorre, and now Delftwood for the past 13 years. He has three apprentices and is the founder and guild master of the Royal Guild of Æthelmearc Metalsmiths. He has served in a number of officer roles over the years, including kingdom chronicler, baronial seneschal, and several rapier marshallates. Q: First, congratulations on your win! Second, how long have you been a practicing blacksmith/silversmith and what experience do you have with metallurgy? I have been making knives since I was about 14 and forging them since about 1990 or so. I am mostly self taught as a blade smith, but have learned a lot about metallurgy and blade performance from ABS Mastersmith Kevin Cashen, and Tim Zowada, and have had long discussions with Dr. Roman Landes, who literally wrote (in German) the authoritative book on the metallurgy of sharpness. I started working with metal professionally as a bench jeweler at 19, although my first exposure to the jewelry trade was in fourth grade (when a silversmith visited his class as part of the American Bicentennial celebrations). I learned enough by watching him that I was able to teach myself chasing and repousse from memory eight years later and started making jewelry in my dorm room at RIT (Rochester Institute of Technology). When I dropped out for a year on sick leave I went to work at a wholesale jewelry repair shop in Ithaca, where I worked my way up from polisher to bench jeweler. Repairing thousands of chains and sizing hundreds of rings is a great way to refine the fundamentals of your craft! I taught myself metallurgy so that I could make better knives, and so that I could make a metallurgically correct 13th century knife to prove Laurel wrong when he said to someone that you could make a perfectly accurate 13th century knife that would work as well as the period ones by filing a blade out of the welding steel you get at a hardware store. I learned enough metallurgy in the process that despite my math education effectively ending after 9th grade, I was hired as a metallurgical associate engineer at an aerospace superalloy manufacturing plant, testing the metal that spins at high temperatures inside jet engines, and at one point was literally doing rocket science with tools that Benvenuto Cellini would recognize (using a chasing hammer and miniature carving chisels to collect samples for chemical analysis from the castings that became the main engine nozzles for the last three space shuttle missions). Q: From watching the episode, it certainly appeared that you were very familiar with the competition’s specific expectations, such as the tests to gauge that the weapons were actually usable and not just impressive looking. So, how did you learn about this competition show and when did you begin watching it? I initially learned about Forged in Fire when my wife (THL Fionnghuala inghean Diarmada) stumbled on it somewhere in the first season. I came down to watch the “cooking show about bladesmithing” and recognized one of the contestants from one of the bladesmithing hammer-ins I am a regular at. I went back and watched all of the episodes that were available and started watching regularly. As to the specific expectations of the show, at one level, my focus in bladesmithing has always been on performance. A knife is a tool, I have always put function first, edge geometry (which determines sharpness), edge metallurgy (which determines how long an edge will continue cutting), and blade geometry (which determines how well a blade will pass through the medium it is cutting), how it will dissipate stress, etc. The society of bladesmiths I have been a member of for over a decade, the New England Bladesmiths Guild (http://ashokanknifeseminar.com/), is a group of bladesmiths who organized the Ashokan Seminar as a vehicle to allow advancing knowledge of metallurgical science and bladesmithing outside of the heavily hype driven atmosphere of the more mainstream knife communities. Q: What made you decide to enter this competition? I am a horrible person. I sat and watched the show, armchair quarterbacking as the competition progressed with my wife (she can now recognize problems developing and strategic errors almost as quickly as I do, and as time went on I started bouncing some of my strategic ideas off of her for input). As time went on, my ego got the best of me and I began to think that I could stand my ground against at least half of the winners skill-set wise, and that I had a better grasp of metallurgical knowledge than the majority of the competitors I had seen. I know and have shared an anvil with more than a few of the past episode winners, and I have a great deal of respect for the ones I know, but I felt that I had about a 50/50 chance in any given group and challenge. Q: How did you prepare for the competition? Since I don’t typically make blades over about five inches in length, before I even considered applying, I tested myself by forging a series of three blades giving myself a two-hour time limit from bar stock to quenched. I figured that if I could do that using all hand tools reliably, that would leave an hour for dealing with whatever material challenge curveball was thrown at me. When I proved to myself that I could do that, I sent in my application. Q: First, you had to forge a Kukri (a large angled knife from Nepal) within a couple of hours in the studio with the other three contestants, then you and the other finalist had several days to make a specific blade in your home workshops. Had you ever made a Kukri or bent blade before? What were your thoughts about the in-studio challenge? Had you ever used the specific type of metal you were given to use? Funny that you ask… I had never made a Kukri before, and in previous seasons competitors had always been tasked with “making a blade in their own signature style” for rounds one and two. I do not really have large blade signature style that would be appropriate for the typical performance tests, so I was planning to do a Persian style with a curved, tapered blade and trailing point, as that would perform well in the typical performance tests from the previous seasons. Then, they served up a curveball having us make a knife in (show judge) Jason Knight’s signature style. I had never intentionally made a blade with that kind of curve before. During the application process, the producer asked me if I had ever made anything “curvy or weird” before, so I ran out to the forge and made a quick serpentine dagger blade and emailed her the picture. As to the type of steel, W1, I have used it to make little hand tools for chasing and repousse, but not for making a big blades. It is chemically similar to some other steels I have used, it is one of the most basic common tool steels, but not one of my usual choices for anything big. I have made several straight-bladed swords before, but not finished any of them into complete swords as I did not have the appropriate equipment to successfully heat-treat anything big to my standards (and the one rapier where I farmed out the heat treatment came back looking like a pretzel). The day before I left to go compete, I made a 45-inch-long electric heat treatment kiln (in his workshop) on the off-chance that I might make it to the final round and have to make something big, but I had not wired it or tested it before I left for New York. I did not have a quench tank big enough for a sword either. I was not expecting to make it to the final round as I had not had any time to actually practice between the producers contacting me that it looked like I might be a contestant and when I had to get on a plane. Q: What were your expectations when you entered the competition? I went down with two goals: the first being to not get eliminated in the first round, and the second being to not embarrass my wife (Okay, not getting permanently injured is was also important.) Everything else was just gravy and experience points. I was going down to have fun. 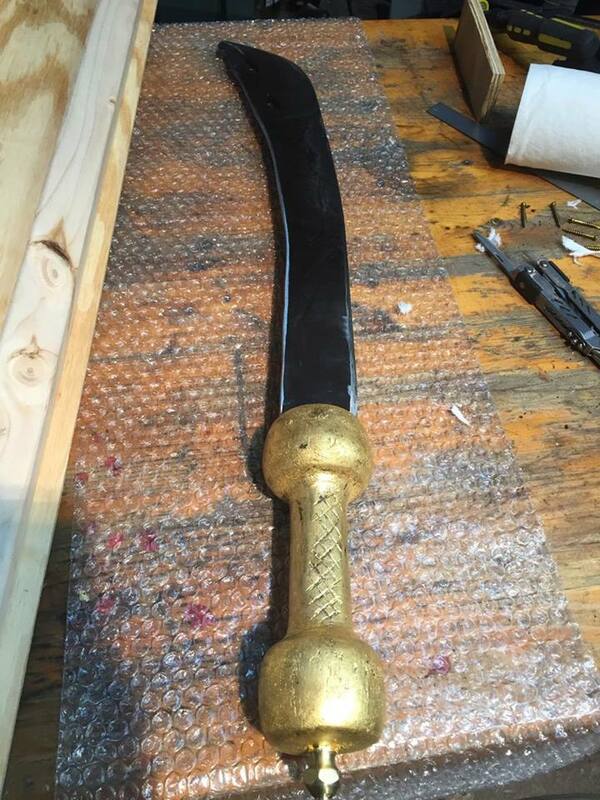 Getting to the third round and facing the challenge of doing this extremely curved African sword with weird geometry and cutouts in the blade was intimidating. Then, adding in the logistical challenges that I had not had time to build any of the equipment that would speed up the build and make dealing with the odd shape easy was an extra piece of intimidation, not to mention that I was facing an opponent who had pulled off the unthinkable comeback (in the second round). I literally wired up the temperature control and modified a pottery kiln into a top-loading heat-treat kiln and welded up a quench tank during my home forge time with the camera recording my every move and the clock running. There were tons of logistical challenges to meet, and that was before I scrapped my first blade on the third day, and forge-welded five bars together to make up a bar with enough mass for a second attempt. Q: How did you approach the Akrafena challenge? What was your process, how was it different or similar to blades you’ve made for the Society? What went well, what was the most difficult aspect of the challenge? How much did you research the historical weapon and how did that affect your design? I researched the Akrafena on the Internet in the 32 hours I had between finding out that I was a finalist and the time my home forge time started. I was hoping that I would find one in the African section at the Metropolitan Museum of Art the morning before I flew back, but no luck. I analyzed about 20 examples and did up a CAD template that was true to the characteristics of the historic examples, and found about 30 pages of Adinkra symbols. Then, after three days everything went sideways and I approached it basically as an exercise in situational triage. I started out with plans to make a fancy, very historically accurate piece while still following the design specifics designated in the rules. Things started to go wrong and I had to scrap the first attempt blade because it would be 1/8-inch shy of the required minimum in one dimension after finish grinding and trying to pull it out was not going as planned. I hit a point where I was not confident and abandoned my three days of work, starting over while there was still time. At that point, my whole strategy was just trying to make sure that I had a blade that could be tested, which was going to be a challenge considering the largest piece of stock I had was ¼-inch by 1 1/2-inch in cross section. Q: What surprised you throughout the experience? I won. Beyond that, the number of people involved in the production of the show, who are never seen on camera. During the three-hour forge sessions, there are easily more than 10 people just operating camera and sound equipment on the forge floor, all of us have at least one, more likely two or three cameras on us at any point during the three-hour sessions. Also the lengths that they go to to ensure that everything is fair, the rules are followed, and that what you are seeing is real, despite the fact that only a tiny fraction of the footage makes it to the final edit. Seriously! Beyond that, you expect that a reality show-type competition would have all sorts of artificially produced animosity between contestants to make drama happen? There was none of that. The production team was very professional and did nothing to try to encourage fake drama. While the four of us ribbed each other constantly in between the timed sessions, it was all good natured and we were laughing constantly (even when someone was the recipient of a particularly good barb) and have stayed in touch in the weeks since. We have plans to continue a good-natured series of build-off competitions under the name “Drunken Monkey Brotherhood Forge” to keep the camaraderie going. Q: Brock, one of the other contestants, wore Ren Faire garb. Did you ever discuss the SCA with him? I asked him if he does SCA. He does Ren Faire and LARP (live-action roleplaying), and that is where he makes his money. Q: Have you ever entered any forging competitions before this? Do you plan on entering any future ones? I do not typically do competitions, really not my style. Just like fencing tournaments, I feel most competitions bring out the worst in people and I want no part of that. This looked like fun and a unique opportunity, so I did it, not really to win, but just to do it. I had fun, and the experience was great, so I would go back and do it again given the opportunity. Q: Is the $10,000 prize going toward any specific equipment or materials? Medical debt. I plan to pay off some stuff, then the money that is no longer going to the creditors will go towards getting back to Florence and Munich, and taking the curator of European Weapons Collections at the Royal Armory at Leeds up on his invitation to take a close look at some pieces in the collections there. Q: Did you get to keep either of the blades you created? All weapons produced are property of the History Channel. Q: Any suggestions or tips for others who want to try entering this competition? My only real tip is this is an extreme athletic event with a technical challenge and a fire show. The round one conditions in the forge are tough, and have taken out several competitors, including one who had to be hospitalized. Understanding metallurgy and edge geometry is essential, as well as the ability to think on the fly. If you missed the broadcast on the History Channel, you can see it here on the show’s webpage. Master Thorpe’s metalworking business, Sunshadow Designs, can be found here on Facebook and here on the web. It was good to read the perspective from someone else. I too competed on Forged In Fire. Filming for me was in April of this year and I’m still waiting for my episode to air. Great article!